I agree on all fronts. i pack compactly in my small car..i don't have room for a 5 gallon jug of water.....that ain't helping anyone should they get burned..i should have a 5 gallon jug of milk if anything....lol. I vend at approx 25-30 events a year. With the bigger events, more often than not, they either have blanket coverage for the food vendors in which I don't have any extra work to do nor extra expense on my behalf. Some of the events are smaller and fall under the radar of the local health department. I am all about being on the up and up and following the rules. I'm curious as a vendor, should during the event registration process, there be no mention about needing a temporary food permit/certificate, how pro-active do you become? Do you reach out to the event organizer and ask them what is required of you? Do you call the local health department and do the same? Or do you 'play dumb' (and I mean that in a nice way, haha) and just assume it's been 'taken care of' and hope for the best? Again, I'm not looking for validation to break the rules. I take this stuff seriously. I recently came across a small school holiday fair. 5 hours for $30 bux...No idea what to expect attendance wise. Could be empty, could be a cash cow based on the time of year and people shopping for gifts. I was told to contact the local health department and the town wanted $140 for a one day TVP. all of a sudden this little 30 event is now $170 for the same 5 hours....Again, rules are rules, but that suddenly made the event not as appealing. Without any previous knowledge of how well attended this event might be, I backed out. Couldn't chance it. I do deal with a lot of health departments. There are some that offer the permits for free after filling out an application. Most are in the 35-75 dollar range. I think it is all a cash grab from the towns. the soulshine text is actually lyrics to a song....my wifes i song is called 'soulshine' and the sauce was kind of dedicated to her. In that case EXCLAMATION POINT!!!!! it's... CUMIN!!!!!!!!!!!!!!!!!!!!!!! The period after the word Cumin? I would just take it out. Updated....Took a lot of the suggestions mentioned....Here is where I am at....I'm ready to roll unless anyone see's anything else glaring? Also, LIMON should be LIMÓN, with the little accentuation mark above the "O", since it's Spanish. Bottom placard: "LEMON * GHOST PEPPER". 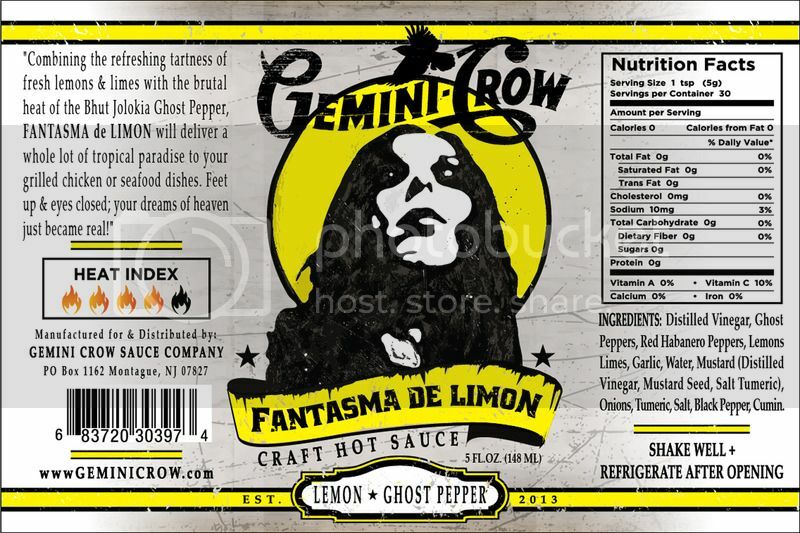 I feel like it should be the other way around: "GHOST PEPPER * LEMON". 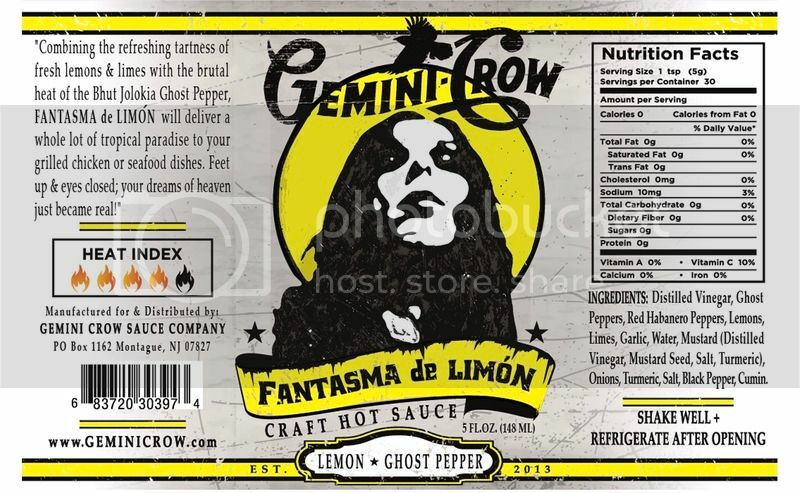 The way it reads right now, to me anyway, is that it's a "lemon sauce" with Ghost peppers in it, vs. a "Ghost pepper sauce" with lemons in it. Hope that makes sense! Good luck! Each sauce will have it's own color scheme...black and white background with the 'Moon' being a different color for each sauce..That will be the differentiation (is that a word?) between the sauce. One more thing, in keeping with consistency, you may want to choose between FANTASMA de LIMON (in description) and FANTASMA DE LIMON (in title). 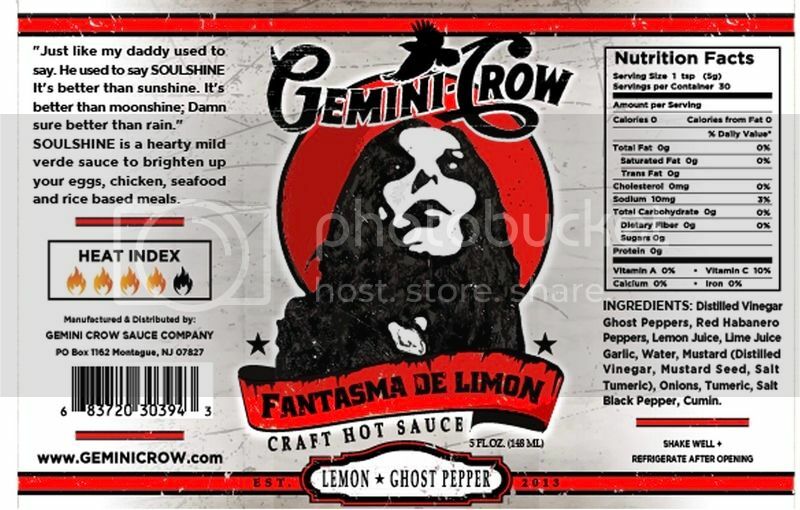 It is understandable when someone writes the product in a review or such they will not use all caps (Fantasma de Limon) but you have a mix of all caps, and all caps minus the de. I would keep these consistent, or, write it out like I did in the written manner in the description, because the "all caps" in the description looks branded but is not consistent with the "DE". Does that make sense? i'm gonna let this thread live for a few days, then go over it with my designer and implement some of the stuff.....this is exactly the kind of feedback i was hoping for! You are missing a dot after www. You need a comma after Lemons, it reads as Lemons Limes. 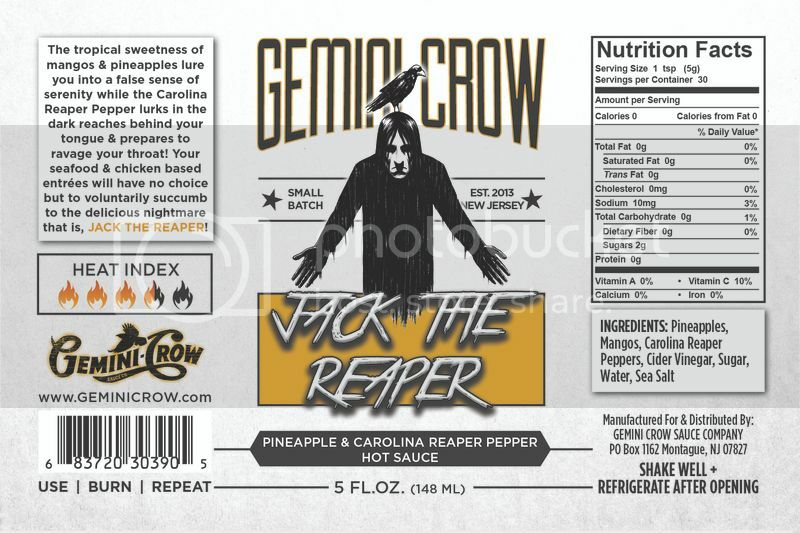 Anyways, Worked with a hot sauce peer this time around who does graphic design for a living and we have worked together for the last several months on my latest and what will be the final re-design of my labels. I love them. I have spent hours pouring over them and making tweaks. I'm at the point where I don't see any tweaks or corrections left to make, so I put it in your hands. Cosmetically I love it. Welcome any thoughts and or criticisms, good or bad. Mainly looking for any critical errors I may have missed. 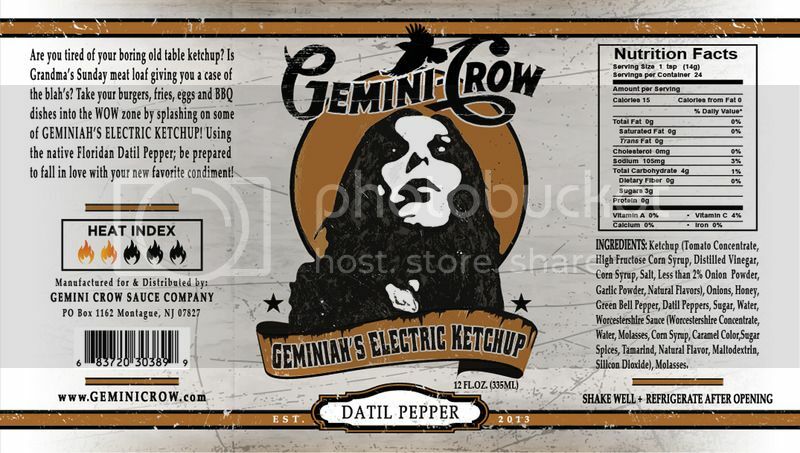 The labels will look the same through all the sauces with the main difference being the color scheme. Looking to go to print before the end of the month. Won't do em all at once as I want to go through what I have left. Hope for a full re-launch by Feb/March 19 with all sauces being under this new look. Have at it & Thanks! I'm not against keeping it front and center. So, tweaking my labels...(yet again), and what I have come up with in my mind does not leave proper room for a 'flavor' profile in the center panel of the label. what are your pro's and cons of keeping the flavor profile upfront as opposed moving it to the left? What is the 2% issue? Hah..I knew that would be asked!!! but really, i have zero qualms.